One of the best things about living in Annapolis, Maryland is how close we are to so many attractions. Within only 45 minutes to 2 hours, you can visit wineries, notable landmarks, historic battlefields, quaint towns, cool cities, and national parks. Whether you like visiting a museum, brewery, or amusement park, there is something for everyone. That being said, there are a LOT of places to choose from, so we narrowed it down. Here is a list of the top fall motorcycle day trips around the Chesapeake area. One of Maryland’s largest state parks, Gunpowder Falls State Park includes more than 100 miles of trails for hiking, running, walking, and biking. There are also opportunities to for water sports like canoeing, kayaking, and fly fishing. Whether or not you are you are into nature, this is a must stop during the height of the Fall Foliage season. You can even check out the Gunpowder Falls Brewery while in the area. TIP: This all depends on the route you take. For Motorcyclists, it is recommended to take 97 to 695 to avoid Baltimore City Center. Tolls apply. There is no end to the possibilities for the fun and attractions Harper’s Ferry has to offer. Located in beautiful West Virginia, within about two hours you can enjoy hiking, historic walking tours, restaurants and so much more! 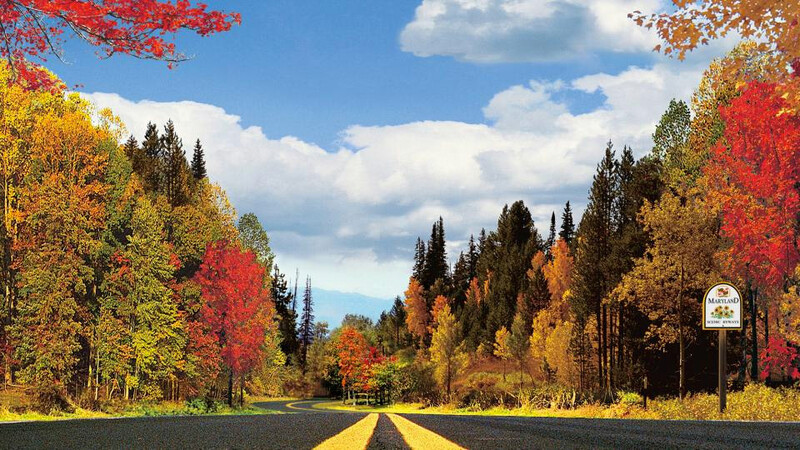 While a beautiful Fall destination, it really is beautiful any time of year! Plus, they have a wonderful Old Tyme Christmas celebration. TIP: Get there early on the weekends during peak season April thru December. A quirky town worth visiting filled with interesting shops and restaurants. Fredrick is home to the National Museum of Civil War Medicine where you can learn about medicinal and surgical practices during that Era. Or, you can book a tour of Maryland’s famous Flying Dog Brewery. It is a laid back town, with beautiful paths and parks plus a unique main street that all offer an excellent opportunity to get off the bike and stretch the legs. TIP: It is a walking town, so make sure to wear appropriate footwear, and dress in layers in case it is warm out. Craving a seemingly unusual combination of chocolate and thrills? Visit Hersheypark. The town was originally built around Milton Hershey’s factory. The park once served as a recreation center for the company’s workers. These days, it offers a fun assortment of rides and attractions for any age. There is also ZooAmerica, featuring native North American animals. Plus, you can visit Hershey’s Chocolate World, to see how they make chocolate and get a free sample. TIP: Try to arrive early to enjoy a full day’s admission and all that the attraction has to offer. Every year Hundreds of thousands of folks visit this historic area. Try to plan your visit during the Annual Battle Reenactment in September. Already busy that month? No worries, this historic site if filled with activities and points of interest perfect all year long. TIP: Travel through many windy and hilly roads so use cautions, especially in the Fall when there are wet leaves on the road. While just a quick drive over the Bay Bridge, located on Maryland’s Eastern Shore, St. Michael’s feels like a world all it’s own. Rated as one of the Top 10 Best Small Coastal Towns in America by USA Today, it is filled with quality hotels, restaurants, and wineries. There are also monthly special events to attend. TIP: Remember the Bay Bridge toll applies. Also, try to leave early on weekends to avoid the beach goers traffic. This destination is a twofer! Come early, hike Sugarloaf Mountain and enjoy the breathtaking view. Once you hike back down, you will no doubt be hungry and in need of a break. Why not stop by the Sugarloaf Mountain Vineyard for a tour and a picnic lunch? Enjoy the bucolic setting while you relax and rejuvenate after an exhilarating climb. Tip: While the vineyard has plenty of wine for sale, it does not sell food on a regular basis. So, if you are visiting on a regular day, remember to pack a lunch! These are only a few samples of the many fall day trip destinations throughout the Chesapeake area. We love to ride and we have all the information you need to prepare for a motorcycle trip. Still have questions? We would love to share our tips and recommendations. Contact Chesapeake Cycles today.